For the Chamillionaire EP, see Ammunition (EP). "Ammo" redirects here. For other uses, see Ammo (disambiguation). A belt of 0.50 caliber ammunition loaded to an M2 Browning. Every fifth round with a red tip is an M20 (armor piercing incendiary tracer). Ammunition (informally ammo) is the material fired, scattered, dropped or detonated from any weapon. Ammunition is both expendable weapons (e.g., bombs, missiles, grenades, land mines) and the component parts of other weapons that create the effect on a target (e.g., bullets and warheads). Nearly all mechanical weapons require some form of ammunition to operate. The term ammunition can be traced back to the mid-17th century. The word comes from the French la munition, for the material used for war. Ammunition and munitions are often used interchangeably, although munition now usually refers to the actual weapons system with the ammunition required to operate it. In some languages other than English ammunition is still referred to as munition, such as French ("munitions"), German ("Munition") or Italian ("munizione"). The purpose of ammunition is to project a force against a selected target to have an effect (usually, but not always, lethal). The most iconic example of ammunition is the firearm cartridge, which includes all components required to deliver the weapon effect in a single package. 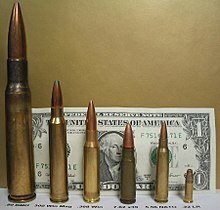 Ammunition comes in a great range of sizes and types and is often designed to work only in specific weapons systems. However, there are internationally recognized standards for certain ammunition types (e.g., 5.56×45mm NATO) that enable their use across different weapons and by different users. There are also specific types of ammunition that are designed to have a specialized effect on a target, such as armor-piercing shells and tracer ammunition, used only in certain circumstances. Ammunition is commonly colored in a specific manner to assist in the identification and to prevent the wrong ammunition types from being used accidentally. A round is a single cartridge containing a projectile, propellant, primer and casing. A shell is a form of ammunition that is fired by a large caliber cannon or artillery piece. Before the mid-19th century, these shells were usually made of solid materials and relied on kinetic energy to have an effect. However, since that time, they are more often filled with high-explosives (see artillery). A shot refers to a single release of a weapons system. This may involve firing just one round or piece of ammunition (e.g., from a semi-automatic firearm), but can also refer to ammunition types that release a large number of projectiles at the same time (e.g., cluster munitions or shotgun shells). A dud refers to loaded ammunition that fails to function as intended, typically failing to detonate on landing. However, it can also refer to ammunition that fails to fire inside the weapon, known as a misfire, or when the ammunition only partially functions, known as a hang fire. Dud ammunition, which is classified as an unexploded ordnance (UXO), is regarded as highly dangerous. In former conflict zones, it is not uncommon for dud ammunition to remain buried in the ground for many years. Large quantities of ammunition from World War I continue to be regularly found in fields throughout France and Belgium and occasionally still claim lives. Although classified as an unexploded ordnance, landmines that have been left behind after conflict are not considered duds as they have not failed to work and may still be fully functioning and simply forgotten. A bomb, or more specifically a guided or unguided bomb (also called an aircraft bomb or aerial bomb), is typically an airdropped, unpowered explosive weapon. Mines and the warheads used in guided missiles and rockets are also referred to as bomb-type ammunition. Ammunition design has evolved throughout history as different weapons have been developed and different effects required. Historically, ammunition was of relatively simple design and build (e.g., sling-shot, stones hurled by catapults), but as weapon designs developed (e.g., rifling) and became more refined, the requirement for more specialized ammunition increased. Modern ammunition can vary significantly in quality but is usually manufactured to very high standards. For example, ammunition for hunting can be designed to expand inside the target, maximizing the damage inflicted by a single round. Anti-personnel shells are designed to fragment into many pieces and can affect a large area. Armor-piercing rounds are specially hardened to penetrate armor, while smoke ammunition covers an area with a fog that screens people from view. More generic ammunition (e.g., 5.56×45mm NATO) can often be altered slightly to give it a more specific effect (e.g., tracer, incendiary), whilst larger explosive rounds can be altered by using different fuzes. The term "fuze" refers to the detonator of an explosive round or shell. The spelling is different in British English and American English (fuse/fuze respectively) and they are unrelated from a fuse (electrical). A fuse was earlier used to ignite the propellant (e.g., such as on a firework) until the advent of more reliable systems such as the primer or igniter that is used in most modern ammunitions. The fuze of a weapon can be used to alter how the ammunition works. For example, a common artillery shell fuze can be set to 'point detonation' (detonation when it hits the target), delay (detonate after it has hit and penetrated the target), time-delay (explode a specified time after firing or impact) and proximity (explode above or next to a target without hitting it, such as for airburst effects or anti-aircraft shells). These allow a single ammunition type to be altered to suit the situation it is required for. There are many designs of a fuze, ranging from simple mechanical to complex radar and barometric systems. Fuzes are usually armed by the acceleration force of firing the projectile, and usually arm several meters after clearing the bore of the weapon. This helps to ensure the ammunition is safer to handle when loading into the weapon and reduces the chance of the detonator firing before the ammunition has cleared the weapon. The propellant is the component of ammunition that is activated inside the weapon and provides the kinetic energy required to move the projectile from the weapon to the target. Before the use of gunpowder, this energy would have been produced mechanically by the weapons system (e.g., a catapult or crossbow); in modern times, it is usually a form of chemical energy that rapidly burns to create kinetic force, and an appropriate amount of chemical propellant is packaged with each round of ammunition. In recent years, compressed gas, magnetic energy and electrical energy have been used as propellants. Until the 20th-century, gunpowder was the most common propellant in ammunition. However, it has since been replaced by a wide range of fast-burning compounds that are more reliable and efficient. The propellant charge is distinct from the projectile charge which is activated by the fuze, which causes the ammunition effect (e.g., the exploding of an artillery round). The cartridge is the container that holds the projectile and propellant. Not all ammunition types have a cartridge case. In its place, a wide range of materials can be used to contain the explosives and parts. With some large weapons, the ammunition components are stored separately until loaded into the weapon system for firing. With small arms, caseless ammunition can reduce the weight and cost of ammunition, and simplify the firing process for increased firing rate, but the maturing technology has functionality issues. The projectile is the part of the ammunition that leaves the weapon and has the effect on the target. This effect is usually either kinetic (e.g., as with a standard bullet) or through the delivery of explosives. Ammunition can be stored in a variety of different methods. Ammunition that is to be used later is stored in ammunition dumps. Firearms can store bullets in magazines prior to firing them. In storage facility gunpowder is stored in a dry place (stable room temperature) to keep it usable, as long as for 10 years. Also its recommended to avoid hot places, because friction or heat might ignite spark and cause explosion. See ammunition dump and magazine for a discussion of modern ammunition storage facilities. The standard weapon of a modern soldier is an assault rifle, which, like other small arms, uses cartridge ammunition in a size specific to the weapon. Ammunition is carried on the person in box magazines specific to the weapon, ammo boxes, pouches or bandoliers. The amount of ammo carried is dependent on the strength of the soldier, the expected action required, and the ability of ammunition to move forward through the logistical chain to replenish the supply. A soldier may also carry a smaller amount of specialized ammunition for heavier weapons such as machine guns and mortars, spreading the burden for squad weapons over many people. Too little ammunition poses a threat to the mission, while too much limits the soldier's mobility. A shell is a payload-carrying projectile which, as opposed to a shot, contains explosives or other fillings, in use since the 19th century. Artillery shells are ammunition that is designed to be fired from artillery which has an effect over long distances, usually indirectly (i.e., out of sight of the target). There are many different types of artillery ammunition, but they are usually high-explosive and designed to shatter into fragments on impact to maximize damage. The fuze used on an artillery shell can alter how it explodes or behaves so it has a more specialized effect. Common types of artillery ammunition include high explosive, smoke, illumination, and practice rounds. Some artillery rounds are designed as cluster munitions. Artillery ammunition will almost always include a projectile (the only exception being demonstration/blank rounds), fuze and propellant of some form. When a cartridge case is not used, there will be some other method of containing the propellant explosion, usually a breech-loading weapon. Tank ammunition was developed in WWI as tanks first appeared on the battlefield. However, as tank-on-tank warfare developed (including the development of anti-tank artillery), more specialized forms of ammunition were developed such as high-explosive anti-tank warheads and armor-piercing discarding sabot rounds. The development of shaped charges has had a significant impact on anti-tank ammunition design, now common on both tank-fire ammunition and in anti-tank missiles. Naval weapons were originally the same as many land-based weapons, but the ammunition was designed for specific use, such as a solid shot designed to hole the enemy ship and chain-shot to cut the rigging and sails. Modern naval engagements have taken place over much larger distances than historic battles, so as ship armor has increased in strength and thickness, the ammunition to defeat it has also changed. Naval ammunition is now designed to reach very high velocities (to improve its armor-piercing capabilities) and may have specialized fuzes for defeating specific types of vessels. However, due to the extended ranges at which modern naval combat may take place, guided missiles have largely supplanted guns and shells. With every successive improvement in military arms, there has been a corresponding modification in the method of supplying ammunition in the quantity required. As soon as projectiles were required (such as javelins and arrows), there needed to be a method of replenishment. When non-specialized, interchangeable or recoverable ammunition was used (e.g., arrows), it was possible to pick up spent arrows (both friendly and enemy) and reuse them. However, with the advent of explosive or non-recoverable ammunition, this was no longer possible and new supplies of ammunition would be needed. The weight of ammunition required, particularly for artillery shells, can be considerable, causing a need for extra time to replenish supplies. In modern times, there has been an increase in the standardization of many ammunition types between allies (e.g., the NATO Standardization Agreement) that has allowed for shared ammunition types (e.g., 5.56×45mm NATO). As of 2013,[update] lead-based ammunition production is the second-largest annual use of lead in the US, accounting for over 60,000 metric tons consumed in 2012. Lead bullets that miss their target or remain in a carcass or body that was never retrieved can enter environmental systems and become toxic to wildlife. The US military has experimented with replacing lead with copper as a slug in their green bullets which reduces the dangers posed by lead in the environment as a result of artillery. Since 2010, this has eliminated over 2000 tons of lead in waste streams. Unexploded ammunition can remain active for a very long time and poses a significant threat to both humans and the environment. ^ a b "the definition of ammunition". Dictionary.com. Retrieved 2017-03-06. ^ "the definition of munitions". Dictionary.com. Retrieved 2017-03-06. ^ "Aircraft ordnance" (PDF). United States Naval Academy. Retrieved 6 May 2015. ^ "How to Properly Store Ammo". Guns and Ammo. 2013-12-22. Retrieved 2019-04-16. ^ Dr. Göttlein Axel. "Eco-toxicological assessment of hunting rifle ammunition". Bavarian Ministry of Nutrition, Agriculture and Forestry upon an initiative of the Bavarian Hunting Association. ^ MacBride, Elizabeth. "A Small Entrepreneur Stands Up To The Trump Administration On Lead Ammunition". Forbes. Retrieved 2019-03-31. ^ Audra Calloway (1 July 2013). "Picatinny ammo goes from regular to unleaded". Army.mil. Retrieved 30 December 2014. Wikimedia Commons has media related to Ammunition. Wikisource has the text of the 1911 Encyclopædia Britannica article Ammunition. Ammunition[permanent dead link] at the Open Directory Project. Until the 20th-century, gunpowder was the most common explosive used but has now been replaced in nearly all cases by modern compounds.